Super Web LLC is a company that publishes various advertising-supported applications. platamoose is one of them and you might detect it on the system. The program tries to convince computer users that it is very beneficial; thus, it will promise you to provide additional features that will enhance your web searches. Do not expect anything good from platamoose because this program is not very reliable. 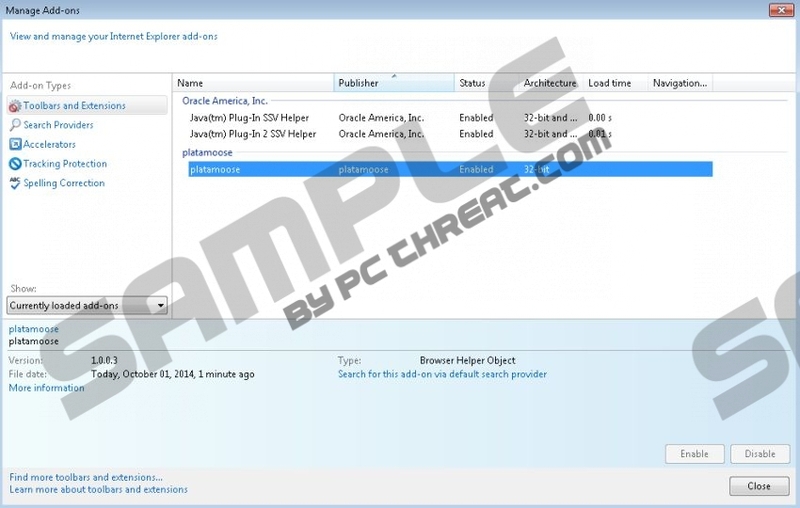 According to the security specialists of pcthreat.com, this software can be classified as adware (advertising-supported application). Even though adware programs themselves are not as harmful as other threats (e.g. Trojans), it is still not advisable to keep them on the system because they might take you to the websites that contain malicious software. Luckily, you can avoid malicious software by deleting platamoose from the system. Read throughout this article in order to find out how to erase this unwanted program. The program works with all the most popular browsers, including Internet Explorer, Google Chrome, and Mozilla Firefox. Thus, it is very likely that you will notice ads on your screen. They might seem very useful and interesting at first sight; however, you should not click on those ads in any way because you might end up on unreliable websites. Of course, not all of these websites are untrustworthy; however, we still recommend that you do not click on ads because your system’s safety is an important matter for us. The majority of computer users complain that platamoose has entered the system without their permission. Thus, there are basically no doubts that this software is closely associated with unreliable free programs. As the research has shown, this adware travels together with them; thus, it is very likely that other undesirable applications hide on your system as well. An ordinary computer user will not be able to eliminate them very easily because their detection itself is rather complicated. You should take into consideration all the risks associated with platamoose and decide about its destiny. In case you wish to remove it from the system, you should know that you can use our manual removal instructions. Unfortunately, this method might not work sometimes. Thus, if you have noticed that you cannot remove platamoose yourself, you should definitely scan the system with an antimalware remover, for instance, SpyHunter. Keep it enabled in order not to allow other future infections to slither onto your computer. Move your cursor to the bottom-right corner. Open the Charm bar and select Search. Type in control panel, click OK, and access Uninstall a program. Find the application that has to be eliminated. Click on it. Quick & tested solution for Platamoose removal.